We understand that you may not need your stair lift or rail any longer, but other handicapped residents may. Please ask about our buy back stairlifts program. If you purchased your lift from us and no longer need it, you may be eligible to take part in this program. Our buy-back price depends on how long you’ve had the lift, the make and model, and the distance from our store. With our buy back stairlifts program, we pick up your gently used chair lift, thoroughly inspect and test it, and bring it to like-new condition. 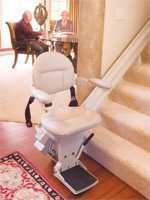 As one of the most well-known stairlift companies in North Jersey, we can offer used lifts at very affordable prices with our buy-back program when they are available and appropriate for your needs. If you purchased your chair lift from another company, please call us at 1-800-287-1793 to see if this buyback program is an option for you. Once we buy back a handicapped lift in NJ, it is thoroughly inspected and tested to ensure it is in proper working order and is like-new for those who are in need of buying a gently used stairlift.